The most complete kit you can find for your oil change - including mileage reminder sticker! The quality oil filter comes complete with a replacement gasket. It's manufactured by German filter specialists, MANN - OE manufacturer for many top European car makers. Castrol has been Land Rover’s official lubricant technology partner for well over a decade, supplying Land Rover dealers with dedicated Castrol Professional oils. Castrol EDGE™ Professional OE is exclusively recommended by Land Rover and the oil used in all new Land Rover vehicles. Land Rover engineers and Castrol technologists worked closely to develop lubricants that are specifically designed for Land Rover engines. This co-engineering approach means that Castrol Professional oils are extensively tested in Land Rover engines during their development phase. This has helped optimize both technologies to deliver outstanding performance, enhanced fuel economy and reduced CO2 emissions. Castrol EDGE Professional is the world’s first certified CO2 neutral engine oil and every liter is certified CO2 neutral according to the highest global standards. Any CO2 that remains in Castrol’s manufacturing process is offset through investment in emission reduction projects such as reforestation in Kenya, clean electricity generation in China and wind farms in New Caledonia. 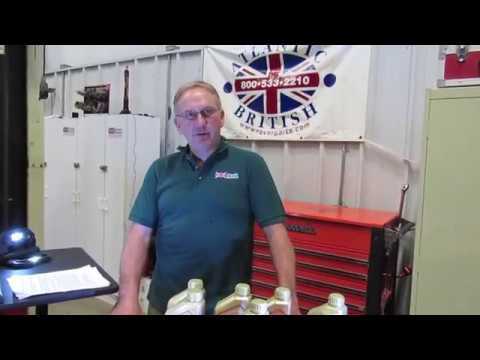 Atlantic British Ltd. Repair & Maintenance Academy How-To Video: Watch Doug, our Land Rover Master Technician, point out the locations of the oil filter and drain plug for a 2005-2009 LR3. Using oil change kit # LR007160SKA, which includes the parts you need for two oil changes: two oil filters plus two drain plugs, it is recommended that this service be performed every 7,500 miles. We also offer money-saving kit # OCK100, which includes oil, oil filter, drain plug, PLUS NEW reminder sticker. Questions about this video? Call us at 1-800-533-2210 or contact us via live chat. Watch Doug, our Land Rover Master Technician, point out the locations of the oil filter and drain plug for a Range Rover Full Size Supercharged, 2006 - 2009. Using oil change kit # LR007160SKA, which includes the parts you need for two oil changes: two oil filters plus two drain plugs, it is recommended that this service be performed every 7,500 miles. We also offer money-saving kit # OCK100 , which includes oil, oil filter, drain plug, PLUS NEW reminder sticker. Please refer any questions or comments to 1-800-533-2210. Watch Gareth, our Land Rover Technician, discuss the recommended Oil change frequency on late model Land Rovers or Range Rovers. Land Rover’s recommended interval of 12K-15K oil changes on late model Rovers with synthetic engine oil is an often-discussed topic in the forum community. Many are saying, and We agree, that the frequency of changes should be half that (every 7,500 miles) or you risk causing longterm wear and damage to the engine. I love the convenience of being able to easily purchase the right parts and service packages. In addition to that the service folks are awesome. They know their stuff. Everything you need for a complete oil change...down to the very last drop of the 8th quart! I appreciate that they include a windshield reminder sticker too. Best deal online, not to mention I'm saving $100 per oil change by not going to the dealer. I was very please with my purchase all the items arrived undamaged and professional but together. I will definitely purchase again and recommend to others!